When a medium accurately predicts your eventual career at a séance hosted by your father, there’s a good chance your life will be more interesting than usual. The fact that Daphne Oram, born in 1925 in Wiltshire, England, had always been musical, concentrating on the piano, was probably a tip-off used by the later-debunked mystic in making his prediction, but the proclamation was just what the 17-year-old nursing student needed to change the course of her life, and she did so in dramatic fashion. With World War II raging, Daphne turned down an opportunity to study at the Royal College of Music to take a position with the BBC in 1942 as a music balancer, a position we’d probably refer to as a sound engineer these days. She was primarily responsible for setting up microphones for live performances and mixing the sound. Another part of Daphne’s job was to follow along with a vinyl record as the orchestra played, ready to switch to the recording seamlessly in case anything went wrong with the live performance. Tape recorders would have eased Daphne’s job considerably, but they weren’t widely available until the 1950s. When they were, Daphne took to tape technology right away, seeing that it had the potential for not only recording music but for creating it. After hours, Daphne would experiment with tape recorders and other sound gear. She’d record short tones from sine wave generators onto tape loops and record the effects of playing them back at various speeds. More complicated sounds, like single notes from a clarinet or even environmental sounds like splashing water, were recorded and mixed with other tones, sometimes even played backward for unusual effects. All of Daphne’s musical experimentation went unnoticed by BBC management. By the late 1950s, Daphne had been promoted to studio manager, and along with fellow recording engineer Desmond Briscoe, she began campaigning for the creation of a new electronic music department, much like one she had seen during a trip to Paris. BBC management couldn’t have cared less about their efforts since they felt that they had all the music they needed. But other producers were interested in Oram and Briscoe’s techniques, and in 1958 the BBC relented. They named the new department “The BBC Radiophonic Workshop,” pointedly avoiding any reference to music so as not to upset the union musicians the Beeb depended on. The group was to concentrate on providing electronic sound effects for BBC radio and television programming, a mandate which grated on Daphne, who felt that the entire point was to create music, not blips and bleeps for commercials and science fiction shows. Within a year of cofounding the Workshop, Daphne quit the BBC and set out on her own, with an entirely new vision of electronic music. 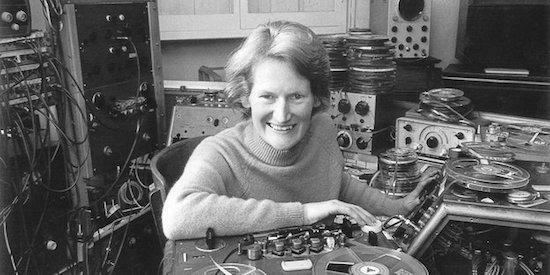 Early in her BBC career, she had seen an oscilloscope used to display an audio signal. Rather than electronically paint an image of sound on a screen, she wondered if it would be possible to do the reverse – to take a painting and electronically turn it into music. To explore this, Daphne set up the Oramics Studios for Electronic Composition. She paid the bills with jingle and commercial work using the tape recorder techniques she had pioneered at the BBC, but her passion was creating a new musical instrument, one that would let her translate drawn images directly to music. She called her as-yet unrealized process Oramics, and spent the early 1960s developing it. Her idea was to draw patterns directly onto 35-mm film stock that could be read by a photocell, similar to the way a movie soundtrack was recorded. But instead of recording a sound, the curves and squiggles on the film would control oscillators and filters to create sound. As technically adept as Daphne was, her Oramics machine remained unfinished until 1965, when she got in touch with a fellow sound engineer, the delightfully named Graham Wrench. They had met years before, and she asked him to take a look at her machine. She explained the concept, and Graham instantly saw how the cathode ray tube (CRT) technology that he had worked on as an RAF radarman could be put to use. He signed on with Daphne, and together they brought the Oramics machine to life. The working system used an oscilloscope CRT to scan each frame of the film. The film with its drawn patterns passed between the CRT, tracing out a horizontal line along its bottom, and a photomultiplier tube. The photomultiplier tube controlled the vertical position of the trace, increasing the voltage on the Y-axis until the trace was visible through the patterns on the film. The Y-axis voltage was sent through a complex battery of filters to audio amplifiers. The whole machine, from Graham’s CRT-based waveform scanners to the pitch controls to the film-handling machinery, was enormous and fussy. It was built on a shoestring budget funded by grants, meaning that Daphne and Graham cut corners wherever possible. 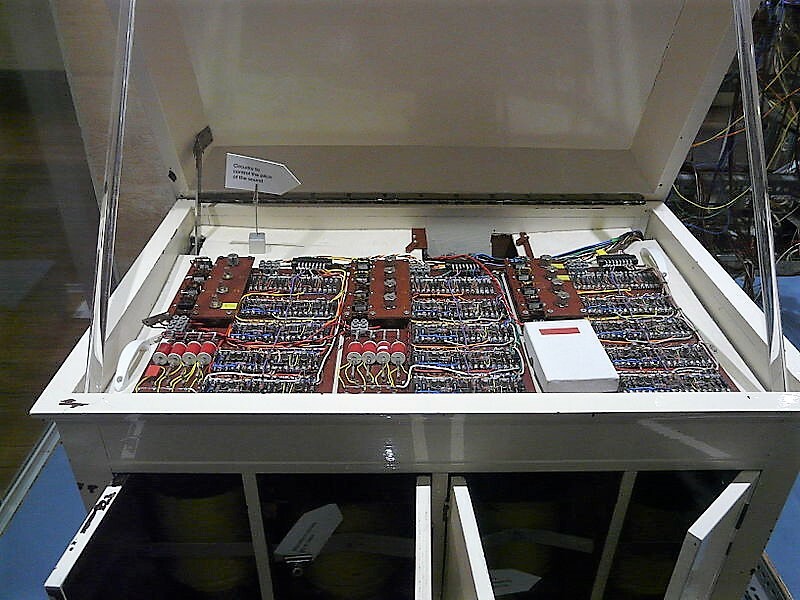 When phototransistors proved too expensive for the control tracks needed, Graham cut open the cases of regular transistors to make them light-sensitive. Everything about the machine was a work in progress, with bits added a Daphne came up with a new idea or deleted as her interests changed. Despite all the years of work she put into Oramics, Daphne only recorded a handful of compositions using the various incarnations of her machine. Oramics became less important to Daphne once the 1970s rolled around, perhaps because the technique was cumbersome and becoming outdated as electronics technology progressed. She did try to revive the Oramics technique in software as the PC age dawned in the 1980s, but by then synthesizers and sequencers had taken a completely different direction that was more accessible to musicians than her method. Oramics came and went, a brief flash of genius in the long history of musicians finding a way to make new sounds. We’re left only with the remains of Daphne’s machine, now relegated to museum-piece status, and the ghostly, throbbing, echoing compositions that came from the machine that could turn drawings into music. Sigh. The wikipedia article gives much more insight as to why Oram is so influential. The HAD iteration left me wondering why Oram is a big deal, if all she did was partially construct a failed approach at sound generation. 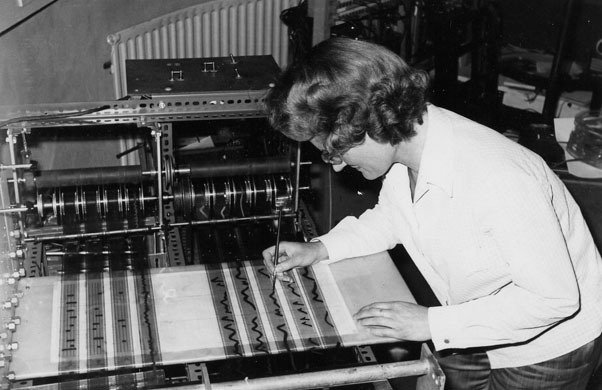 Oram was more like a sound scientist/philosopher than a musician, and the Oramics machine gave her a way to experiment. Intriguing, but as an electronically-minded person, I want to know how it worked! From what I’ve gathered here and elsewhere, even a high-level/UI explanation is lacking. The waveforms drawn, though inspired by an oscilloscope, clearly don’t correspond directly to the audio waveform; the circuitry controls pitch and amplitude, etc. And why’s a CRT used for scanning, when phototransistors (made from cut-can regular transistors!) and photomultipliers are involved? Cool article to inspire a search or twelve in a previously unheard-of [by me] “pioneer” and technology, though. This seems to be similar to a flying spot scanner, where the light sensor sees a wide area and the CRT only lights up the point being scanned. I’m guessing the CRT is the emitter that scanned a sample (the drawn waveform) to sense changes in intensity (I guess binary, i.e. on or off) with the photomultiplier tube(s) or phototransistors as the detector in an array pattern. I’m still reading into as I can’t visualize how this would be analog since seems digital to me. It’s like a single line, linear array and the CRT is scanning a single line across the light sensor. Giving you a numeric reading on what par of the film is blocked along the line with the waveform, and part is clear/transparent. Depending on how finely you divide the sensors picking up the light on the CRT (how tight can you pack that linear array, you get an output feeding your audio control. That’s what I’m concluding based on descriptions so far. I remember discussions in ’69 in high school electronics about paper cutouts of a wave sample being pasted on an o’scope where the trace would hover at the top edge of the paper as it scanned horizontally in the frequency of the note to be made. Timebase would be pitch. To low it dims and it would raise the voltage till too bright. In a feedback loop it would try to trace the pattern and output the sample at any pitch. The scope face was covered with one light sensitive pickup fed into the circuit. The problem was it would often loose lock and fail. Square waves probably gave it fits. Without Oram, Doctor Who would have been dull if not at all. Just Shakespeare, and royalty dramas. Douglas Adams wouldn’t have been as creative. The Book would just have to have been read. I’ve been listening to electronic music since the early ’80s and never heard of this artist. That fact that she laid down the groundwork that made all that wonderful old Doctor Who music and sound effects possible is fantastic. Even though I never knew about her before she died, she sure had a great effect on me. A rather belated **BRAVO** for Daphne Oram!! Um…was not the theremin closer to the ‘birth’ of electronic music back in the 1920s? She was the first woman if I understand correctly… especially such an elaborate device. The Theremin females were more operators/musicians.